The day before on the 4th, I fished with Charlie and his wife Rochelle, it was a really slow day for steelhead except for one take down that had to been at least a 15 pound steelhead. It was on for about a minute before it broke her off under a bridge. But before it had broke the leader it ran alot and jumped alot. It actually jumped completely out of the water sideways so we had a real good visual of it. Then when it did finally break the line it gave us one last look at it, when it did a victory jump. Charlie was really upset at losing such a big fish, but the big ones are hard to catch, so it happens some times. The next day he felt alot better about the whole situation and wasnt disappointed like he was the day before. We had to get back out there the next morning to get some redemption. We had only been in the first hole 5 or so minutes and my line had only been in the water for 30 seconds when my rod started doubling over while still in my hand. I had a huge fish on! The fight only last about 15 seconds. The fish got to the surface and started thrashing around and that was the end of that as my leader snapped. I didnt check the drag on my reel as it was way too tight, lesson learned and also one of Charlies favorite plugs lost! Major bummer. About 40 minutes later my rod gets slammed again in the same hole, it felt like a real nice one. Charlie grabbed the other rod and proceeded to reel it in to get it out of the way. But when we got it in the line was tangled around mine, so he had to do some quick thinking and cut the line off of mine really quick. While this was happening my line went limp like the fish got off, but it must of been just laying in the hole chilling. Because when the line was off and i started reeling in he came back alive and started jumping in the middle of the rapid and the fight was on again! But we had to pull anchor and go after him. While we were floating down the rapid the line went limp once again and thought again that i had lost it. Moments later the fight was on again! We got anchored up at the bottom of the rapid and i fought the steelhead for a few more minutes until we were able to land him. It was a real nice wild steelhead buck, probably about 29inches and real healthy looking. We let him go after we got a quick picture or two, hopefully he found a mate and made some baby steelheads. That ended up being our only fish of the day. We floated to Casey Park twice and the second pass through big butte creek had cleared good enough to where we could of floated to Rogue Elk park. But we had to call it a short day at around 11am. Was another great day fishing with Charlie from Fishingtherogue.com If you want a good fishing trip contact Charlie and mention my name/blog for a really nice discount. Thanks for reading and tight lines! This entry was posted on April 12, 2011 by blazer_shane. 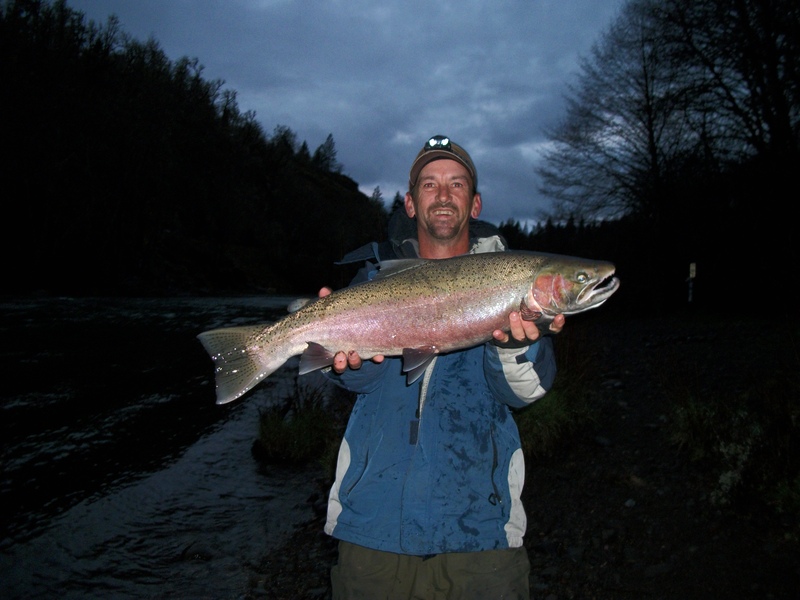 It was filed under Rogue River, Uncategorized and was tagged with Fishing, fishingtherogue.com, kwik fish, Oregon, plugs, Rogue River, shady cove, steelhead.